If you suffer from depression, PTSD, or another mental health condition – there is good news: you have legal rights in the workplace! While this is not a novel idea, it is one that is not widely followed. This prompted , the U.S. Equal Employment Opportunity Commission (EEOC) in December to issue a publication discussing the legal rights of employees under the Americans with Disabilities Act (ADA) and the Family and Medical Leave Act (FMLA). The publication, “Depression, PTSD, & Other Mental Health Conditions in the Workplace: Your Legal Rights,” addresses a number of frequently asked questions concerning employment discrimination and mental health conditions. To better understand the rights of persons with mental health conditions in the workplace, we discuss the questions and answers provided in the EEOC’s recent publication. First, and perhaps most importantly, employees should understand that an employer is prohibited from discriminating against him or her on the basis of a mental health condition. For all intents and purposes, the ADA treats mental health conditions just as it does physical disabilities. As such, an employer cannot discriminate based on a mental health condition or a physical disability, and an employer is also required to provide reasonable accommodations for either a mental health condition or a physical disability. As the EEOC clarifies, when it says that an employer cannot discriminate against you based on your mental health condition, this means that an employer cannot refuse to hire you, refuse to promote you, or fire you simply because you have a mental health condition. However, an employer is not required to keep you on the job if your mental health condition prevents you from doing your job, or if you “pose a ‘direct threat’ to safety,” according to the publication, which means “a significant risk of substantial harm to [your]self or others.” At the same time, an employer is prohibited from relying on “myths or stereotypes about your mental health condition when deciding whether you can perform a job or whether you pose a safety risk. Instead, the employer must rely on objective evidence. 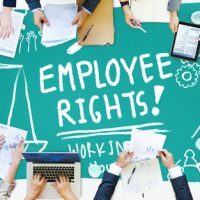 In addition to the fact that your employer cannot discriminate against you, as we mentioned above, you also may have “a legal right to a reasonable accommodation that would help you do your job,” the EEOC clarifies. In other words, if your mental health condition would “substantially limit” your ability to engage in major life activities (e.g., your ability to concentrate, to regulate thoughts or emotions, to communicate with others), then you may be entitled to a reasonable accommodation at work. To obtain a reasonable accommodation, you may be required to make your request in writing and to describe your mental condition and how it impacts your ability to do your job. You may not have to be specific if you do not want to disclose particulars of the condition to your employer. If you have questions about your rights regarding mental health conditions at work, or if you believe you have been the victim of employment discrimination as a result of your mental health condition, an experienced Florida employment discrimination lawyer can assist you. Contact Scott • Wagner and Associates today for more information.